Discover the benefits of installing quartz countertops into your kitchen. The kitchen is the focal point and epicenter of every home, so it needs to be well-designed and thought out. 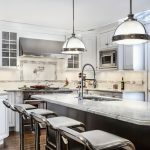 One of the most important features of any kitchen are the countertops, which need to handle all of the abuse that comes with cooking. You need to choose a material that is highly durable as well as aesthetically pleasing. Quartz is one of the most in-demand kitchen materials on the market right now. Discover a few of the major benefits of investing in quartz countertops for your kitchen. One of the most attractive benefits of investing in quartz countertops is that they are incredibly strong. Quartz countertops are the perfect options for your kitchen because they stand up well to the wear and tear that comes with cooking. You will never have to worry about damaging your quartz countertops if your drop an item on it. Quartz is also highly resistant to corrosion and stains. When it comes to quartz countertops, they do not require extensive maintenance compared to natural stone structures. Engineered quartz is made of resins that creates a non-porous material that is resistant to bacteria growth. So, engineered quartz does not have to be re-sealed which saves you time and money. Quartz countertops do require regular cleaning like all other types of countertops. If you are in the process of looking at quartz countertops, you have a wide range of options to choose from for your kitchen. Quartz comes in a variety of colors, styles, and designs so that you can blend it in with the rest of your kitchen. Once you install quartz countertops inside your kitchen, they will enhance the look and feel of the entire space. This entry was posted on Monday, April 16th, 2018 at 10:11 am. Both comments and pings are currently closed.